To say salt isn’t good for us isn’t exactly headline news. Most people, especially those with high blood pressure, know it’s important be mindful of their sodium intake. A recent study takes this advice further, suggesting a diet rich in potassium is an important partner to a low-sodium diet. Researchers for the Center for Disease Control, Emory University, and Harvard University examined the habits of over 12,000 Americans. They found people who eat a diet high in sodium and low in potassium have a 50% increased risk of death (due to any cause) and twice the risk of death from a heart attack. This is an important finding because the average American eats approximately 3,300 mg of sodium per day, which is about twice the recommended daily amount. Add to that the fact that most Americans do not meet the daily recommendation of 4,700mg of potassium, and you have a recipe for disaster. Sodium is a naturally occurring substance found in many foods. Your body holds on to excess water in an effort to eliminate, or wash out, the sodium. When you have high blood pressure, this can be dangerous because the extra fluid raises your blood pressure even more. 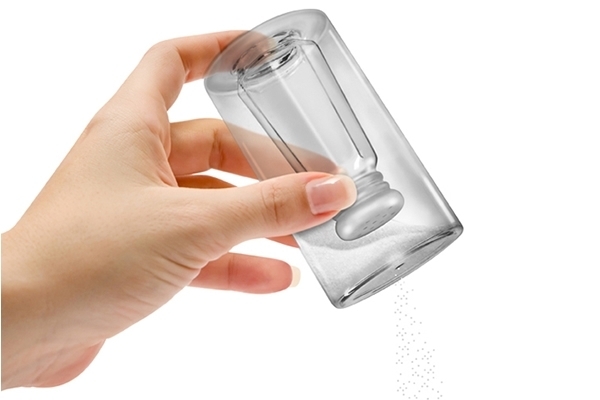 Since salt is made up of mainly sodium, it’s often at the heart of the issue. So, what role does potassium play to help balance your blood pressure? Several studies, including a study published in the journal Hypertension, indicate eating a diet high in potassium actually lowers blood pressure. Although scientists aren’t sure how potassium does this, they believe it has something to do with the way potassium acts on your blood vessels. By either preventing the contraction of blood vessel walls or by promoting relaxation of the vessel walls, potassium decreases the pressure that blood places on the blood vessels – which is what blood pressure is all about. Here's the bottom line: eat fewer processed foods and more fruits and veggies. Processed foods are high in sodium and low in potassium - exactly the combination that increases the risk of heart disease. Fruits and vegetables provide plenty of potassium, and, as long as you don't sprinkle extra salt on top, provide a healthy amount of sodium.